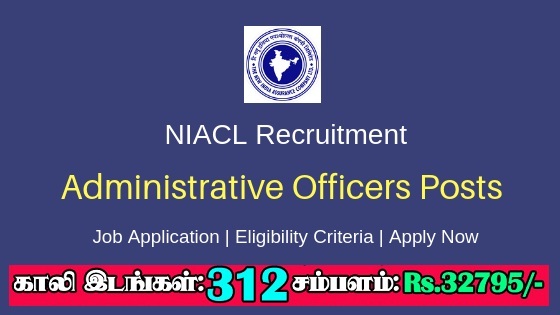 NIACL Recruitment 2018 2019 | NIACL invites Online Application for the post of 312 Administrative Officers (AO) (Generalists & Specialists) (Scale-I) Posts. NIACL AO Jobs Notification 2018 Released. NIACL invites online applications for appointment in following AO post in The New India Assurance Company Ltd. Opening Date and time for Submission of Application is 10.12.2018 and end up by 26.12.2018. NIACL-312 AO Recruitment 2018 | Any Degree @ Across India. For Gen/ UR Candidates - Minimum Age: 21 years Maximum Age: 30 years i.e. a candidate must have been born not earlier than 2nd Dec-1988 and not later than 1st Dec-1997 (both dates inclusive).